Royal Ontario Museum – BIG – Let's Make Content together! Beautiful, Elegant, Majestic, Extraordinary. These are the words that come to mind strolling down the great halls of the Michael Lee Chin Crystal into the BIG exhibit at the Royal Ontario Museum. Featuring 40 artifacts from around the globe, BIG is a captivating exhibit inspired by BIG ideas, BIG names, BIG news, and BIG social and cultural significance. The 40 creations, rarely shown due to their exceptional size and fragility, were chosen from among the thousands of precious pieces in the ROM’s collection of textiles and costumes. From a 600-year-old Peruvian feather tunic; rich, brilliant textiles from India, to Albania, to Sierra Leone; to masterpieces by fashion legends John Galliano, to Alexander McQueen, to Tom Ford, BIG has something to offer every visitor—young and old, fashionista and historian. Curators Dr. Sarah Fee, Anu Liivandi and Alexandra Palmer chose to tell the compelling stories behind the artifacts with succinct, thoughtful descriptions, including why each belongs in BIG. The exhibit lets visitors explore and understand the complex meanings behind textiles and fashion. A seating area has been specially designed for those interested in viewing the exhibit’s films about the selection and mounting process of the artifacts. Walking through BIG means gaining an understanding of how textiles and fashion have been entwined throughout the ages. 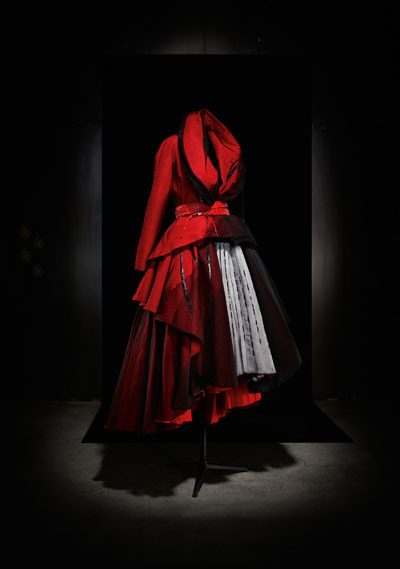 The centerpiece of the exhibit is the one-piece coatdress designed by John Galliano for the House of Dior 2011 Spring- Summer Haute Couture Collection. This legendary dress exemplifies the true art of fashion. The iconic piece took designers and seamstresses 175 meters of cloth and a grand total of 500 hours to create. The ROM specially commissioned a video for the exhibit that documents the making of this intricate haute couture marvel and beautifully captures the complexity of the production process. Galliano was dismissed from the House of Dior for his anti-Semitic comments shortly after the production of the dress. Though his Dior career may have been cut short, exhibits like BIG show why his iconic dresses will live on in the world of fashion. An equally significant though less extravagant artifact is a handspun cotton cloth from Sierra Leone. This piece epitomizes the notion that first appearances can be deceiving. In West Africa, even a little piece of white cloth holds great cultural importance. Associated with rain and spirits, a white cloth is said to protect, honor and heal when made into a dress or given as an offering. It is also believed to have life giving properties when adorned by a woman. Galliano’s dress and the West African cotton cloth may be worlds apart in the eyes of a fashion critic but they are both big in their own ways. All of the BIG artifacts are aimed at enlightening and entertaining those who are fond of gaining a fresh perspective on sartorial beauty, and highlights how BIG an influence fashion has on our lives. The exhibit is on display at level 4 of the Michael Lee-Chin Crystal at the Patricia Harris Gallery of Textiles & Costume and will be open to the public till Fall 2013. P.S: Wrote this piece a while back for Bold Magazine‘s print edition. Edited by Kate Browning.